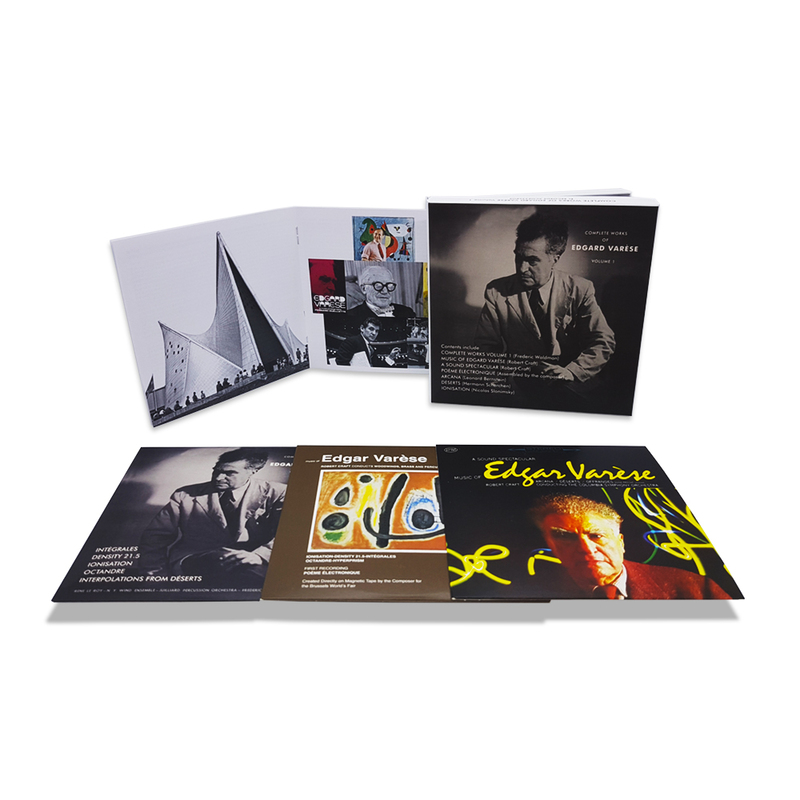 A 3 disc box set anthology recordings of the compositions of the pioneering twentieth century avant-garde composer Edgard Varèse, spanning a period of almost three decades – from the first recording of one of his compositions, the Nicolas Slonimsky conducted Ionisation, in 1933. Igor Stravinsky considered that in the use of percussion and wind instruments Varèse was an innovator of the first rank. Like his contemporary, Varèse tapped into something that classical composers had been politely sidestepping for centuries: rhythm. The result is an art of extreme individuality; a music singular in its beauty. Some of the notoriety of the Waldman sessions derives from the fact that these are the very recordings that introduced Varèse to the young Frank Zappa. Zappa remembered discovering the composer as an “astonishing experience” and over the ensuing years turned more people to Varèse than anyone else. Also included here is the 1954 world premiere of Déserts, a work conceived for two different media: instrumental sounds and sounds electronically produced. Performed by the Orchestra National with Hermann Scherchen conducting, with tape interjections supervised by Pierre Henry (and at the Théâtre des Champs-Élysées, the same venue where forty years earlier, Stravinsky had scandalised Paris with Le Sacre du Printemps), the recording is a fascinating historical document of modern art. The audience, patient at the outset of the performance, soon protests at the strange juxtaposition of orchestral dynamics and modern industrial sounds. The intrepid conductor battles through the unrest to the end, at which point the audience is a cacophony of appreciative applause on the one hand and hisses and jeers on the other. The conservative establishment was outraged and Varèse would not be invited to work in France again. Nevertheless, Déserts is today considered to be the first important work of electronic music. Now the Poème électronique – an example of “Organised Sound”, the technique that came to occupy Varèse’s attention on his return to composition in the 1950s – created in close collaboration with the architect Le Corbusier for the Philips Radio Corporation’s pavilion at the 1958 Brussels Exposition. Le Corbusier designed the pavilion in the shape of a three-peaked circus tent externally and in the shape of a cow’s stomach internally. This provided a series of hyperbolic and parabolic curves from which Varèse could project his 480-seconds-long composition. Along these curves, placed with infinite care, were no fewer than 400 loudspeakers through which the Poème swept in continuous arcs of sound. The sound itself was accompanied by a series of projected images chosen by Le Corbusier, some of them photographs, others montages, paintings, printed or written script. The result was both a discordance and accidental concordance between aural and visual impressions. The audience, some fifteen or sixteen thousand people daily for six months, evinced reactions almost as kaleidoscopic as the sounds and images they encountered – terror, anger, stunned awe, amusement, wild enthusiasm.